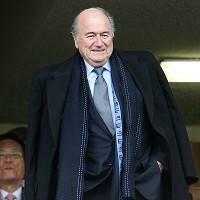 FIFA president Sepp Blatter claims the World Cup in South Africa has already proved the doubters wrong. Critics had predicted that fans would be deterred by high travel costs and the high crime rate in the country, while even FIFA themselves admitted earlier this year that ticket sales had not gone as well as they had hoped. Blatter told reporters in Johannesburg: "More than 500,000 fans will have come to South Africa and some are talking about the figure being even higher. The forecast from 'old Europe' was the fans wouldn't come - well here they are."